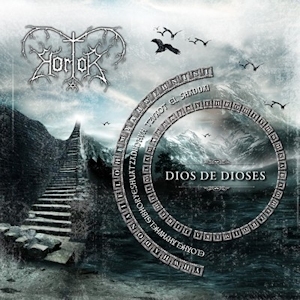 Hortor is a band I had heard of but never actually heard until I was asked to write this review of their new album, Dios de Dioses (God of gods). The band describes itself as being rooted in black metal, symphonic black metal, and Viking metal, so how can I go wrong, right? I must say I was caught off guard by the opening track “Salmo,” (“Psalm”) which opens with a plainchant-like “Hosanna” section over rain and thunder sound effects before introducing (synth) strings. I mean, Hortor is (un)black metal, right? Is this the right album? The second track, “Me he Banifado con una Preciosa Sangre” (“Cleansed with Precious Blood”) confirms that yes, in fact, it is. It is, however, far from an old-school sonic assault. Throughout the album, the blast-beats and breakneck riffs are interrupted by thinner, quieter sections with a half-time feel. There is even a section about three minutes into the fourth track, “Cerca Viene Libertard” (“Freedom is Near”) where it sounds like the vocalist is offering a prayer over the sparsest of guitar accompaniments, giving the impression that time has stopped altogether. The very end of the album recalls the beginning as the rain returns as the metal gives way to a solo piano for the final minute of “Nombre que es Sobre Todo Nombre.” (“Name Above All Names”). The judicious use of a soaring soprano vocalist on some tracks is a welcome timbrel addition. She is probably best used during the ending of “Meixico Tierra de Dios” (“Mexico, Land of God”) where her smooth vocal descant is in stark contrast to the spitting black metal vocal style underneath it. In summary, this is as fine an (un)black metal album as I have heard in recent years. There is not a lot of variety in many of the riffs, but the overall musical content is good enough that this does not really detract. The mix is good; none of the instruments seems out of balance with the others, and the vocals are also well-placed. The lyrics are bold, ranging from anti-occult message to a song of national-pride, but above all, the songs on this album are songs of praise to God and point the way to His salvation. The lyrics are entirely in Spanish, so that may turn off some people, but I think the Spanish really works in this context. I did locate a copy of Ancient Satanic Rituals Are Crushed in Dust to listen to for comparison sake, and I believe Dios de Dioses is a major step forward musically. It just sounds like a more mature album and a more musically-sure band. If you are a fan of (un)black metal, do yourself a favor and add this album to your collection.